In 2010, there were 31,672 deaths in the U.S. from firearm injuries, mainly through suicide (19,392) and homicide (11,078), according to CDC compilation of data from death certificates. Among racial and ethnic groups, blacks are over-represented among gun homicide victims; blacks were 55% of shooting homicide victims in 2010, but 13% of the population. By contrast, whites are underrepresented; whites were 25% of the victims of gun homicide in 2010, but 65% of the population. For Hispanics, the 17% share of gun homicide victims was about equal to their 16% proportion of the total population. The black homicide death rate has declined 50% since its peak in 1993, and the number of black homicide deaths fell by more than a third (37%) from 1993 to 2010. The white homicide death rate has declined by 42% over that time, and the number of white homicide deaths declined 39%. 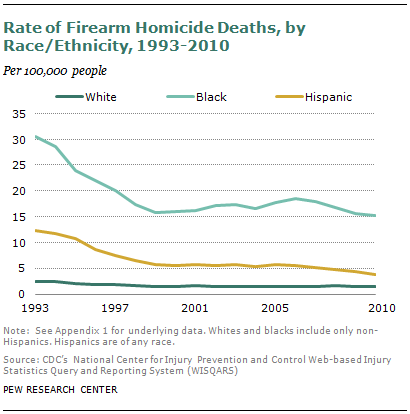 The Hispanic shooting homicide rate fell 69% from 1993 to 2000, and the number of deaths declined by 40%.